Accessories	Combining forces for simpler installations. they expand system capabilities and provide networking flexibility, helping your customers get more. It all adds up to faster installs and more reliable communications. The Enphase Combiner Box consolidates a PV circuit combiner, revenue grade meter, consumption meter, and IQ Envoy into one pre-configured outdoor enclosure. Delivering a fast, standardized installation with more reliable system communications. 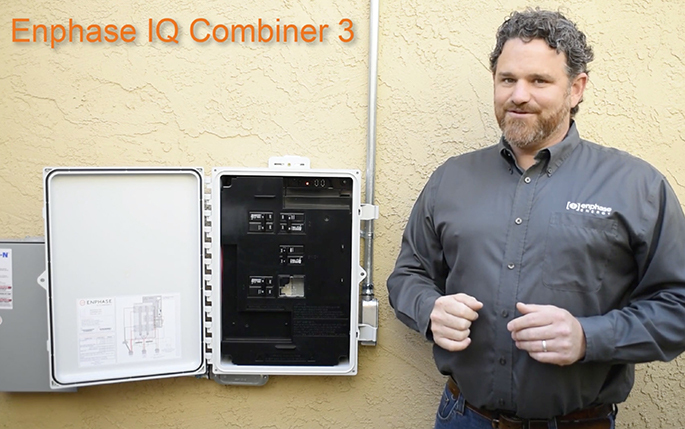 The Enphase IQ Combiner 3 incorporates all the great qualities of our previous combiner boxes, with a few additional features that installers have been asking for. Take a closer look. The Enphase IQ Combiner 3™ consolidates interconnection equipment into a single enclosure and streamlines PV and storage installations by providing a pre-wired solution for residential applications. The Enphase IQ Combiner+ expands on the capabilities of previous Enphase Combiners by allowing for larger systems and swappable breakers. The IQ Combiner+ reduces labor costs, consolidates interconnecton equipment and provides a standardized installation with more reliable networking. The Enphase IQ Combiner Box is a cost effective way to get the most from the IQ Envoy. The IQ Combiner Box will help to cut installation time, and consolidate interconnection and communications equipment costs by 20%. Easy and reliable cellular networking of an Enphase System, with flexible data plans to meet your needs. Pre-configured for residential systems up to 60 microinverters, each modem enables bi-directional communication, allowing for remote firmware updates. When used with an Envoy-S Metered or IQ Envoy, the Enphase Consumption CT enables home energy consumption monitoring.